I have received your letter dated October 21, 1976. In that connection, whatever Giriraja will accept, arrange and I'll do. In the foreign countries India is much advertised as a poverty stricken country. But, if India can give Her spiritual culture, Krsna consciousness, she will be glorified everywhere. This should be the aim of Gita Pratisthan. Prabhupada: Yes, that is government. That is ksatriya. Ksat trayate iti ksatriya. Ksat means injury, and one who gives protection from injury, he is ksatriya. Just like Pariksit Maharaja. As soon as he saw a cow is attempted (to be injured)..., immediately he said, "Who are you, rascal? You are trying to kill this cow in my kingdom?" That is ksatriya. And nowadays, even if I kill you, the police will see from there; he'll not come. This is government. And when the finished killing, then he will say, "Who is this man?" He'll note down, "A man is killed." And then inquiry, and then finished. Who is the man killed and what is happened? Nothing of the sort. Inquiry and finish. Big commission report. Cow protection and God consciousness. Visitors welcome. 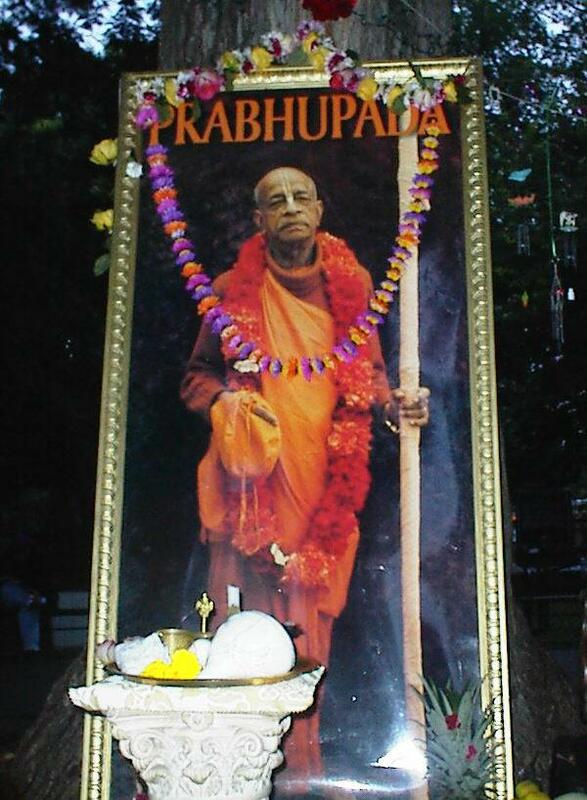 Prabhupada: (reading sign?) "Cow protection and God consciousness. Visitors welcome." That's nice. So, which way we shall go now? Cow protection, they are surprised: "What is this nonsense, cow protection?" Huh? Do they say? "Cow is for eating, and you are protecting?" Cow protection. It has to be corrected. "Farming, cattle raising and business are the qualities..."
Prabhupada: No, it is especially mentioned go-raksya. Krsi-go-raksya-vanijyam vaisya-karma svabhava-jam. And then...? Is that your civilization? Killing mother? Prabhupada: That's all right. Vegetable has also life but we are not killing. When you pluck out the flower, the tree is not killed. When you take a fruit, the tree is not killed. When you take grains, automatically they die. Then you take the grains. There is no question of killing. But even it is killing, it is not as murderous as killing a cow. Why the state hangs a man when he kills a man? The man can plead that "So many animals are being killed every day. If I kill one man, what is the wrong there?" The punishment is that "You have killed one important animal." Therefore the Bhaga..., krsi-go-raksya, that cow should be protected because it is a very, very, important animal. It does not say, "Other animal." Or does not say, "All animals." He said, "Cows," because important. It's supplying you milk, so important food. She is your mother and you are killing mother? Is that your civilization? Killing mother? "Mother is old, and mother is no more supplying milk. Kill." Is there any such sanction? Rather, old mother is given more protection. And what is this civilization, killing the mother? In the morning we require milk immediately, and the mother cow is supplying. And when she cannot supply, kill her. What is this philosophy? Prabhupada: Dog is good; cow is bad. Dog is creating always nasty things, and cow is so pure, even the stool is pure, and she has to be killed. Identity with individuality in spiritual life is real knowledge. jnanena--by knowledge; tu--but; tat--that; ajnanam--nescience; yesam--whose; nasitam--is destroyed; atmanah--of the living entity; tesam--their; aditya-vat--like the rising sun; jnanam--knowledge; prakasayati--discloses; tat param--Krsna consciousness. Prabhupada: No, practically also we see. Formerly big, big saintly person they used to live in the forest, and their livelihood was fruits and milk. They used to keep cows and draw milk from them, and whatever fruits are available in the forest, and they have given us these literatures, Vyasadeva. So the... He has written Mahabharata, one hundred thousand verses and similarly, this Srimad-Bhagavatam, he has given us eighteen thousand verses. And each verse is full of so grave meaning that if you study, it will take months and months together. So they developed such nice brain simply by drinking milk and fruits. Yes. We are neither vegetarian, nor non-vegetarian. Rather, "prasadarian." Prabhupada: All of them, give, each, one. We can prepare hundreds of nice preparations from milk. Therefore cow protection is required. Do you like? Reverend Powell: Thank you. Yes, I think I need it. You, you, you're completely vegetarian, and not have meat of any kind and not eggs at all? Prabhupada: We are not even vegetarian. Prabhupada: No. We are negative of vegetarian and non-vegetarian. We are not vegetarian, neither non-vegetarian. We eat Krsna prasada. Rather, "prasadarian." We are neither vegetarian, nor non-vegetarian. Because we don't eat which is not offered to Krsna. Things are prepared according to the order of Krsna, and when Krsna eats, we take the remnants of foodstuff. Therefore we do not fall in the group of vegetarian or non-vegetarian. We are transcendental.